Pleasant Green Grass Provides Organic Lawn Care, Landscaping & Mosquito Control in Raleigh, Hillsborough, Durham, Chapel Hill, Carrboro, Cary, Apex & Morrisville North Carolina area. 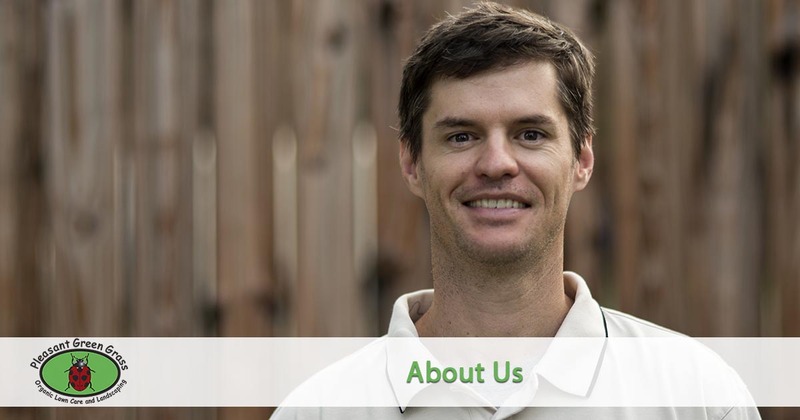 Pleasant Green Grass has grown “organically” from its local Durham, NC roots to become the region’s largest and longest running organic lawn care company. Pleasant Green Grass was founded by Scott Walker in the community of Pleasant Green Durham, NC. After graduating from NC State University, Scott studied the science of fertilization, weed control, and the threats regularly used pesticides and other chemicals pose to people, pets and the environment. Scott moved out west to train and work for four years with an organic lawn care company. The experience of working with an established organic lawn care company helped him to combine his study of the science of environmentally friendly lawn care with excellent business practices and knowledge of what customers really want. Scott created a safe and natural customized program for organic lawn care that avoids the conventional hazardous substances, produces better performing lawns and the best part is that he offers these services at about the same price as conventional “chemical” lawn companies. Scott, and Pleasant Green Grass, has developed proprietary and completely unique fertilization and weed control methods specific to the typical North Carolina clay soil. After testing the program with strong results and happy customers, Scott returned to the community of Pleasant Green to begin Pleasant Green Grass Organic Lawn Care. Referrals from satisfied customers helped grow the company to one of the largest organic lawn care companies in the state. The current use and abuse of synthetic pesticides by the lawn care industry have been shown to potentially cause cancer, birth defects and pollute our water ways is alarming and in large part unnecessary. The lack of science-based decisions taken by most lawn care programs and lack of knowledge is also problematic. The natural and organic alternative to chemical herbicides and pesticides exists and has been used for generations with excellent results. We take the health and safety of our employees, our customers and their babies, children and families, our pets and wildlife extremely seriously. We are TRULY all-natural and organic (certified organic whenever possible), committed to excellent customer service, getting the job done right and making this world and the North Carolina Triangle region just a little bit healthier and more sustainable. Pleasant Green Grass ONLY uses all-natural and organic products making them safe for babies, children and families, pets and our employees. Pleasant Green Grass is a company that has grown the right way with good, knowledgeable people. Our integrity and concern for the environment, and for creating healthy ecosystems, in our lawns and elsewhere is genuine and what keeps us passionate about our work. Scott believes that all employees of Pleasant Green Grass should have the knowledge and training to satisfy our customers. Pleasant Green Grass takes pride in our employees and we work to hire the best possible people. Our technicians are experienced, trained in the use of organic applications and friendly! Scott thinks it’s important to provide a safe and enjoyable atmosphere for all employees and we work hard to do so. We are always open to feedback and work hard to establish a personal relationship with all of our customers. Pleasant Green Grass was formed to be part of our larger solution. Now it’s your turn, too. The best way to learn more about the lawn care and landscaping services we offer is to give us a try. We offer a 100% satisfaction guarantee so there is no risk for you! We also make it easy to get a quote and schedule your service.